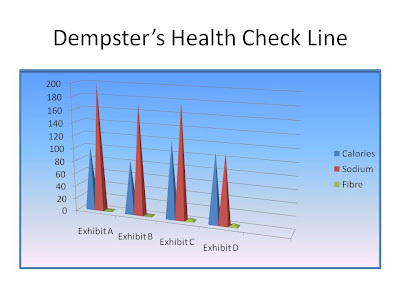 Weighty Matters: Dempster's bread and one of Health Check's main failings. Dempster's bread and one of Health Check's main failings. Here's a great lesson on why yes or no style front-of-package food labeling programs misinform. First ingredient? Whole grain whole wheat flour. First ingredient? Water, and then whole grain whole wheat flour. To see things graphically, click the graphic up top. Important to note too, the graphic up top doesn't reflect the fact that Exhibit A isn't actually a whole grain bread. 4 very different breads. 4 breads that are not nutritionally equivalent. Exhibit A's made with refined flour and has nearly double the sodium of whole grain Exhibit D. Exhibit C's got 37% more sodium than Exhbit D and is otherwise pretty much identical. Exhibit B's got 15% fewer calories, 12.5% less sodium and is made with healthier grain than Exhibit A. Yet they've all got the same singular Health Check. Put 'em all in a row and if you're using Health Check's to shop, they're all the same. Front-of-package programs need to be far more robust than just a yay or nay.